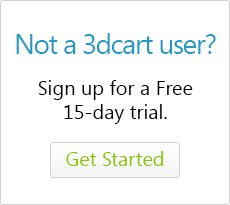 Your 3dcart interface also allows you to keep an active log of your customer base. This can be useful for maintaining working relationships with your customers, tracking their purchase histories, and basic management of your customers and their details. Whenever a customer purchases something from your store, they are required to enter their billing and shipping information. They also enter their email information to receive the various order notifications that are generated by the cart. When this occurs, a profile is automatically created for them in your store. After their initial purchase, returning customers can simply log into their account with your store by using the email address they signed in with originally, and have all their billing/shipping information saved for them. If you have a large amount of customers, you can narrow the list or find a specific customer by clicking the "Advanced" button at the top right of the page to search by name, group and whether or not the customer is enabled. Once you have found the customer you want to manage, click on the customer's name or look to the far right and click on their ""Action ->Edit" button to view their details. Your customer's main information area. Here you can review and edit their contact, email, billing and shipping information. You can also specify if the customer belongs to a certain Customer Group, and other details that might be pertinent to the specific customer. You can also use the "Login to Account" button located along the top right to log in directly to the customer's account on your live store to review how the store behaves for them specifically and help troubleshoot any issues they may report. This tab will give you a list of the customer's complete order history including order status and links to the actual orders within your cart. Similar to the Orders Tab, this tab will show you the customer's complete history of purchased items. If you have the built-in 3dcart Customer Relationship Manager (CRM) enabled, all your customer's contact tickets will be contained in the CRM tab. This area will show the specific customer's tickets, responses and interactions. If the specific customer has left any product reviews within your store, they will be listed under this tab of the customer's profile. If the customer has placed themselves on a waiting list for a particular product that is out of stock, you can review their request in this tab. This tab will show statistical information about the customer's purchase history and trends. Use this tab to review your customer's rewards points history. You can also add rewards points manually if desired. When viewing and editing customers, you can also manually add customers to your store. To do this, go to Customers ->Customer List and click on the "+Add New" buttonfound along the top right of the page. Then, enter your customer's billing/shipping and contact information and click "Save" (at the top right) to add their profile. For more in-depth information on creating and managing your customers, please review our online tutorial available by clicking here.